Replacement: None. We are no longer carrying this propeller breakout in our catalog. This page is for reference only. Programming with dedicated cores instead of interrupts can be an adjustment which is why Parallax developed the SPIN language and Propeller Tool IDE to make it easier to manage. No special hardware programmer is needed, program over serial using an FTDI or similar! Code can be sent directly into the volatile on-chip RAM for development or piped to external flash memory for deployment. This breakout board gives you everything you need to start playing with the Propeller P8X32A including external flash memory so your program persists through power-down, a crystal oscillator footprint so you can add a clock source if you want to speed things up and all of the GPIO broken out to standard 0.1" spaced headers and labeled. Yes! Yes! 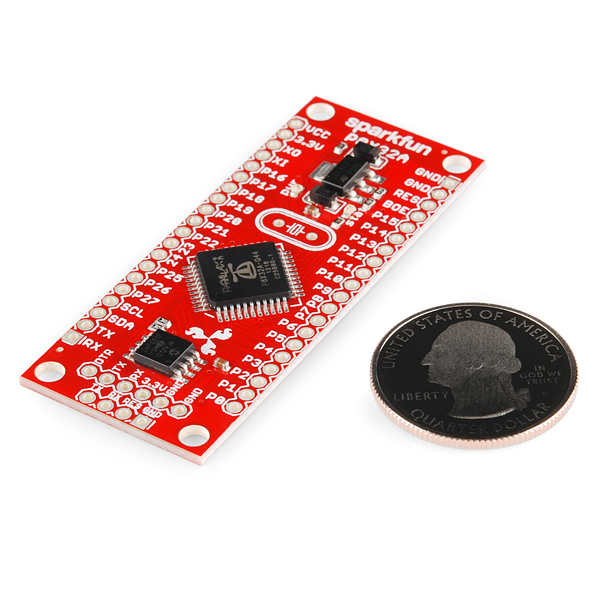 So happy this MCU made it to Sparkfun, So much power and flexibility in a little package. This is a very welcome addition - I've been curious about the Propeller boards for some time now. I designed my CpuBlade 1"x1" P8X32A board way back in 2011 - it is still available for US$17.50 +$4pp (see http://clusos.com/home/1952.html ). As well as all the above, it has an onboard 3V3 regulator (from 5V, max 6V DC input), and the transistor circuit (for the PropPlug download so you can use a cheap FT232 board or equivalent) to program the EEPROM. The xtal is socketed and can be overclocked to 6.5MHz (104MHz). 5MHz, 6MHz or 6.5MHz can be provided. Definitely should be cheaper. I'd recommend selling their QuickStart board, and this, for the same price ($25). $35? This should be at least 10 dollars cheaper. Wow, that is really similar, but I can honestly say I did not see your board before I made this one. I guess this is a very general design, you can't go many other ways if you want this in a breadboard. My favorite MCU! Looks like I have one more thing to add to my Propeller collection! The best microcontroller on the market. Bar none. After having this I cannot ever justify or see myself going back to a PIC or ATmel chip. Oh and the OBEX is amazing. 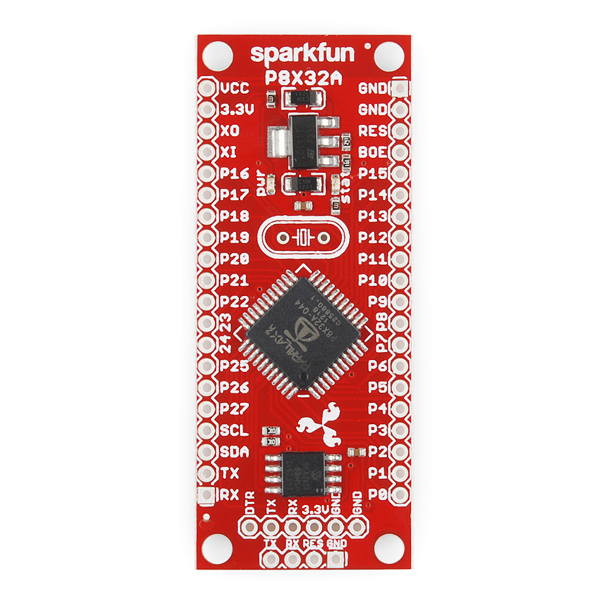 Not that I am trying to funnel sales away from sparkfun but if you go to parralax's website you can get a propeller for 7.99, and eeprom for a couple bucks. note, if your using the propstick, you need to apply 5v+ to the VCC pin, not 3.3v to the 3.3v pin just below it. anything under 5 on the top left VCC pin will not power the board on enough for the propstick to recognise it (PWR led comes on but propstick will not see it. Must have 5v+ on VCC pin). I haven't seen the lack of decoupling caps mentioned anywhere in these comments. The Propeller should really have decoupling caps next to each set of Vcc pins (four in this case). Look at Cluso99's design (he has posted in these comments) to see how decoupling should be done. I can't tell if there is a power copper pour on the top layer or not. If there is, it could help with the decoupling problem. 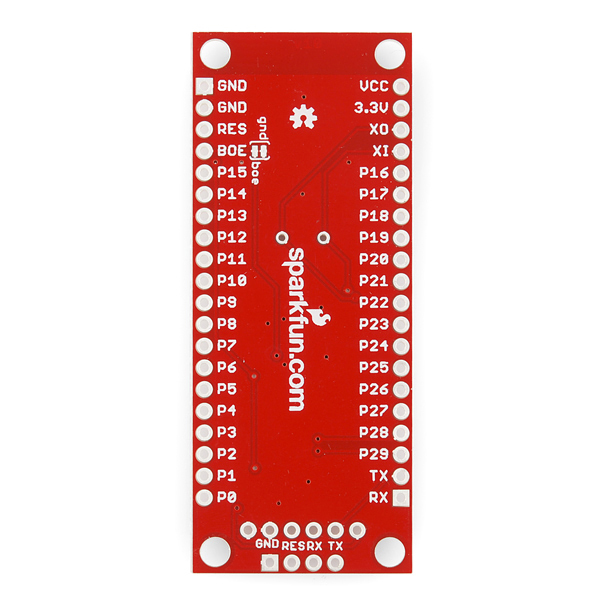 I agree with others, it's great to see a Propeller board made and sold by SparkFun. I also agree this seems kind of over priced. BTW, anyone intersted in learning to program the Propeller should check out Parallax's Propeller forum. It's a friendly place and they go easy on noobs. So, it looks like it has one serial uart? (I don't know much about the Propeller, just curious, and I've found that multiple uarts is really nice to have). There is one OBEX object that's a 4xUART that takes one Cog, so if you don't have too much application logic, you could load your prop up with 16 UARTs (could do more, but that's all the pins will support) in 4 COGs. Wow, that's a lot of UARTS, awsome!!! Propellers use software peripherals so you can have loads of UARTs (or I2C, SPI, or whatever else) on whatever pins you want. 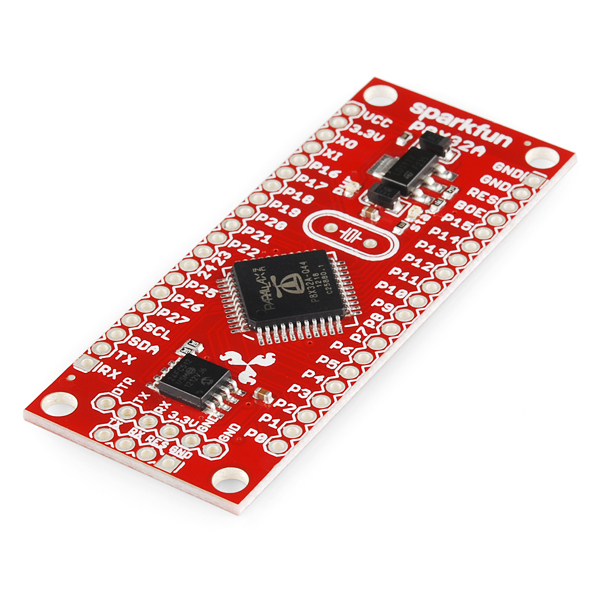 But, two of the pins are used for serial programming and are connected to the Sparkfun FTDI and Prop Plug headers. Also, is the EEPROM 512Kbit, or 512KByte? Apparently it's flash rom, not EEPROM. It's an I2C EEPROM. The description is wrong. The schematic link shows it as an EEPROM. Also, it's most likely 64Kbytes (512Kbits).